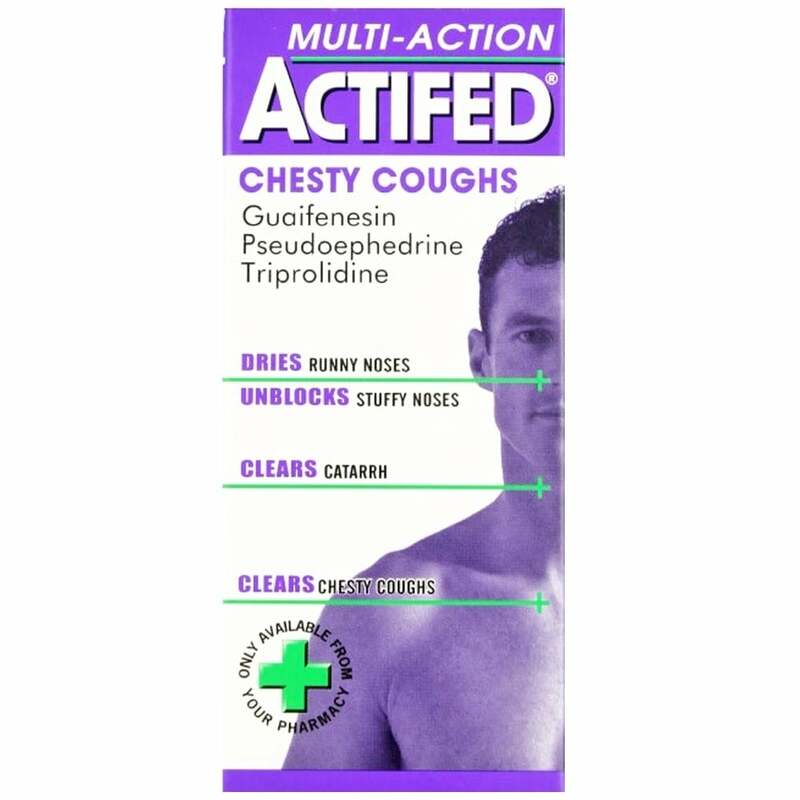 Actifed Chesty Cough liquid is a multi-action liquid which clears chesty coughs and helps unblock stuffy noses, dries up runny noses and clears catarrh. This multi action cough medicine is ideal for treating chesty coughs and nasal congestion. Helping to clear secretions in the chest by making them thinner and dries secretions in the nose and chest. This medicine causes drowsiness which helps you to get an undisturbed sleep. Adults and children over 12 years: Two 5ml spoonfuls every four to six hours. Children 6 to 12 years: One 5ml spoonful to be given every four to six hours. No more than four doses in 24 hours. Each 5ml spoonful contains Guaiphenesin 100mg, Pseudoephedrine hydrochloride 30mg and Triprolidine hydrochloride 1.25mg. Not suitable for children under six years. Do not use if you suffer from high blood pressure or heart disease. Do not use if you are taking MAOI drugs or within two weeks of stopping MAOI drugs. If you are unsure, speak to your pharmacist before using. Side effects may include headache, palpitations and sleeplessness.